I’m 14 weeks pregnant today! Size of Baby: A lemon…about 3 1/2 inches long and 1 1/2 ounces! 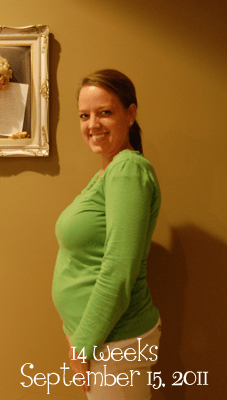 Maternity Clothes: I’m in that awkward stage between normal and maternity pants. I’m too big for normal pants (despite the weight loss), but I’m too small for maternity pants. Anytime I’m wearing maternity pants I actually have to stick my belly out a little to keep them up! Gender: I don’t know…I keep flip-flopping. Noah’s referring to it as a “he,” which I think is what’s making me wonder if it’s a boy. I did have a dream a few nights ago that we went to the gender ultrasound and it was a boy! Movement: Nothing that I can feel. But pretty much every time I go to listen to the heartbeat on the doppler, he/she is moving like crazy…I’ll find the heartbeat, and it’ll only hang around for a few seconds because we’re off to a new place! I think when I finally can feel it, I’m going to feel it A LOT. Sleep: It’s great…I’m only waking up once in the middle of the night, and that’s actually working pretty well – I take my vitamins then, and go right back to sleep, because if I take them any other time they make me sick. So it works out! What I miss: Nothing at all! I finally got the guts up to take my first bath (as opposed to shower…yes, I do bathe :)) since I found out this week. I’m slowly getting the courage to try things that are still ok, but scare you during pregnancy! Cravings: Not really many this week. I’m getting my appetite back (most of the time), so there aren’t just certain things I will eat. Don’t laugh at this – but I have been DYING for Ramen Noodles! I don’t know why to save my life, but several nights this week that’s all that has sounded good. So weird, especially since I haven’t wanted pasta since I got pregnant! Symptoms: Sickness, on and off. I can tell a HUGE difference if I don’t take Zofran at least once a day. I tried not taking it this weekend, and if I hadn’t known better, I would have thought I had a stomach bug…it was bad. So I’ve started taking it once in the afternoons, even if I’m not too bad, just because it will get bad if I don’t. Still going to bed pretty early too! Best Moment This Week: Finally realizing that I do have a little bit of a bump that’s not all bloat! 🙂 And getting to hear the heartbeat on the doppler…that is so much fun.